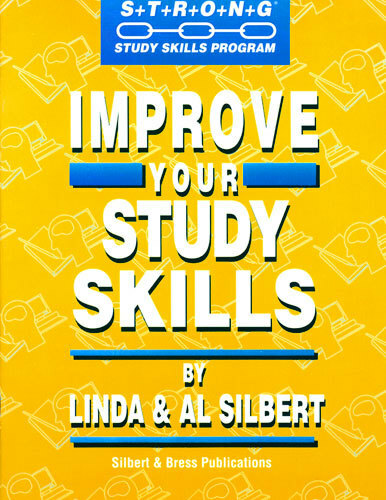 Strong Learning Centers® Improve Your Study Skills, by Linda Silbert, PhD, and Al Silbert, EdD, gives teens study skills activities to improve grades and test scores. This interactive, multi-sensory, how-to educational workbook, one of five in a series, shows teenagers how to learn, study, and remember. Study skills activities include time management, organizational skills, homework tips, homework study tips, and more. Middle school and high school teachers, special education teachers, tutors, and homeschool parents find this an effective and outstanding learning resource. The workbook is a great resource for students with learning disabilities such as ADHD, sensory processing disorder, language processing disorders, dyslexia, and dyscalculia, and dysgraphia. Pick up a copy of "Improve Your Study Skills" Today. Help your teenager raise grades and improve test scores. Order All Five Study Skills Handbooks for the Price of Four! Help Your Teens Raise Grades Today.